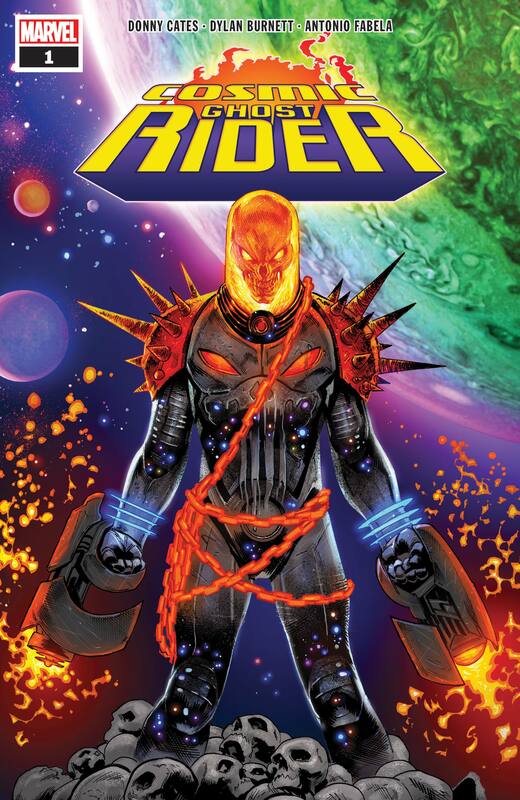 Cosmic Ghost Rider is the latest addition to Marvel's long line of Ghost Riders. But is he actually any good? Ryan Easby finds out. Cosmic Ghost Rider is a peculiar comic. Based upon a character introduced in Donny Cates 2018 Thanos series, he’s an alternate universe version of Frank Castle (You may know him as The Punisher) who (get ready for this): fought in a war; watched his family get mown down; became The Punisher; died when a piece of stray rubble from Thanos’s final attack killed him; went to hell (because y’know, he might have killed one or two people); became the Ghost Rider; went insane; met Galactus when he came to Earth and was given the powers of the Silver Surfer; met Thanos AGAIN and became his right hand man; literally met Death; died again. And this all happens BEFORE this comic even starts. The basic premise of this comic is that Cosmic Ghost Rider (I’ll just call him CGR from now on because otherwise it’s a bit of a mouthful) is in Valhalla, asks to be sent back into the universe with all his powers and travels back in time to kill baby Thanos, a situation that lead to the spectacular image you can see above. Except, he sorta can’t kill him because a baby isn’t guilty of anything so instead he raises him. Yes, that’s right, CGR raises the baby that grows up to essentially be Alien Hitler. Did I mention this comic is a bit weird? Because, you see, this comic is a little bit weird. This comic is so weird we get a scene of a baby Thanos sat in a bar drinking alcohol with CGR and that’s probably the single most sane thing in this entire comic. The insanity shouldn’t be taken as a negative factor however, quite the opposite: this is the epitome of why I love comics. It’s the height of “comics are stupid” and I think it’s a wonderful thing. Comics shouldn’t ever be taken too seriously, and especially not ones about a man who’s entire head is on fire. Before reading this comic, I’d never really read much of Donny Cates’ work, and after reading this comic I’ve got an overwhelming desire to purchase every single Donny Cates comic ever published, it was THAT good. Cates writes with an underlying humour, his tongue planted so far into his cheek that you can see it poking out the side of his face. The writing in this is something special: Cates is going to be held up as one of the writing greats in the future alongside the likes of Grant Morrison, Frank Miller (Y’know, when he’s not having an ego trip) and Alan Moore. Something especially must be said about the art by Dylan Burnett. It’s absolutely amazing and suits the tone of the story to a tee. The colours are vivid and popping, displaying the insane range of the Marvel universe and quite how many different areas exist within it. The main covers for the series are striking and eye-grabbing, such as the one seen below. Overall, Cosmic Ghost Rider is a wonderful five issue series about a man trying to fix the past and realising that you cannot change what once happened, only deal with what will happen. It’s a definite recommendation for any comic book fan and especially for any fan of The Punisher, Ghost Rider or indeed, fans of fun. 13 Reasons Why: Controversial or a PSA?